Brian Paco Alvarez sent inÂ these picture of theÂ Bow And Arrow Sign last week, shortly after it was installed on Las Vegas Boulevard in the Downtown Las Vegas Cultural Corridor. Iâ€™d meant to show it to you then and be the first to cover it. Butâ€¦.. 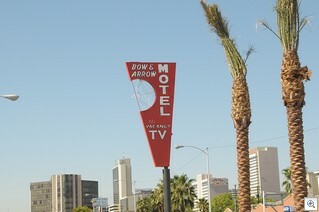 Historic Bow & Arrow Motel Neon Sign Planned For Placement On Las Vegas Boulevard Monday Night, August 24. Â The first of three vintage neon signs will be set into place on Las Vegas Boulevard, in the Cultural Corridor, on Monday night, Aug. 24, during the overnight hours. The completely refurbished Bow & Arrow Motel sign will be installed in a median island north of Bonanza Road, as part of the $1.1 million Neon Sign Improvement Project. 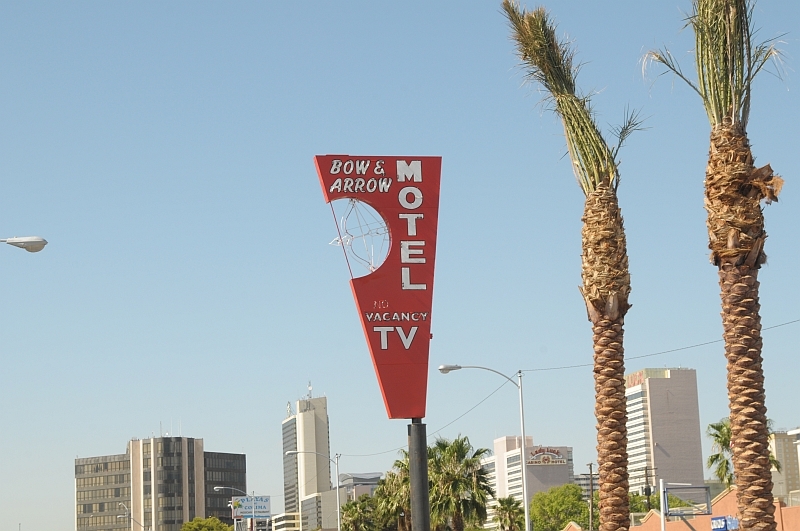 Â Â Years ago, the Bow & Arrow Motel was located on Las Vegas Boulevard at Wyoming Avenue near Dinoâ€™s. The sign is believed to have been installed at the motel during the late 1950s or early 60s. Â Â A total of three completely restored neon signs are planned for placement on Las Vegas Boulevard, from Bonanza to just north of Washington Avenue, as part of this project. New landscaped median islands are also being installed. Â Â The other two signs that will be installed in the coming weeks are the Silver Slipper sign that sat atop the Silver Slipper Gambling Hall, and the Binionâ€™s Horseshoe sign that used to be at Binionâ€™s Horseshoe Casino on Fremont Street. Â Â Once the signs are in place, crews will work to provide power and conduct a series of tests prior to the signs being officially put into service. 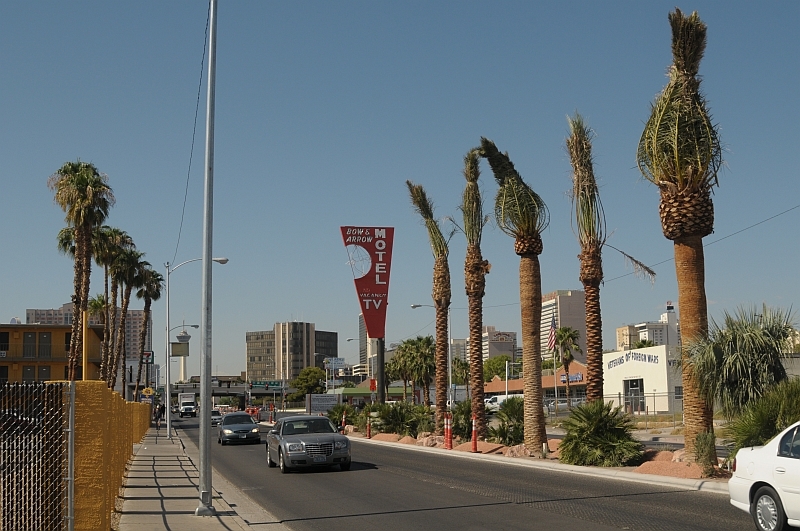 Â Â The signs being installed on Las Vegas Boulevard are in the heart of Las Vegasâ€™ Cultural Corridor. The corridor is made up of the highest concentration of cultural institutions in Las Vegas and includes Cashman Center, the Las Vegas Library, the Las Vegas Natural History Museum, Lied Discovery Childrenâ€™s Museum, The Neon Museum, the Old Las Vegas Mormon Fort State Historic Park, and the Reed Whipple Cultural Center. Â Â These three signs are also the first in a series of historic neon signs that will be completely restored and eventually placed on Las Vegas Boulevard, from Washington to Sahara Avenue, as part of the Las Vegas Boulevard Scenic Byway Program. Â Â Funding for this project is provided by the Centennial license plate fund and the city of Las Vegas. The signs that are being used in the project are on loan from the Neon Museum. The Bow & Arrow Motel sign was originally restored through donations to the Neon Museum in the name of Las Vegas historian Frank Wright. Â Rafael Construction is the contractor. 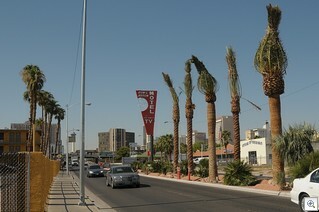 The city of Las Vegas is managing the project. The improvement project started in May and is slated for completion in late September or early October.